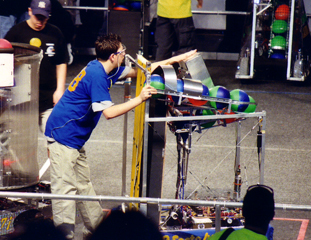 In 2006, everything was different and new: new Andy-Mark shifting drivetrain, a ball harvester conveyor, a ball shooter (new to everyone) a pan/tilt turret, and a track to get balls from the harvester to to turrented shooter. Our first regional was UTC New England held in Hartford, CT at a new venue. We finished as 5th seed and completed as finalists with teams 181- Birds of Prey, Hartford, CT and 558- Elm City Robotics-Robo Squad, Elm City, CT. In the Long Island Regional, we ranked 1st in the qualifying rounds both Friday and Saturday and became Regional Champions after choosing Team 271 Bay Shore H.S. and allying also with R.I.C.E. Team 870 Southold H.S..
At Championships in Atlanta we were on Curie and were chosen by the 8th Alliance of 1305 ICE3 from North Bay, ON Canada, and Team 180 of South Fork & Martin County & Jensen Beach High Schools & Clark Advanced Learning Center in Stuart, FL. We finished the season as Quarter-Finalists. In the Fall we expanded our activities to include two full-field off-season events in Deer Park, NY and North Brunswick, NJ. 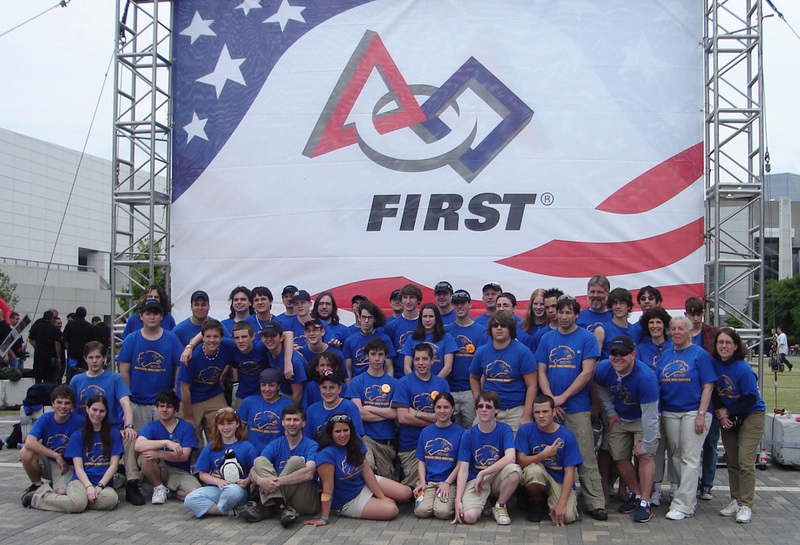 We met once a week to conduct training for our huge influx of Freshmen concentrating on demonstrations of pneumatics, programming w/ the Edu robot, making our spare 2005 practice robot operational so the Robotics class could then dismantle a working version, rebuilding part of our 2003 robot. We reconstituted our animation group, but still lacked an experienced mentor. We participated in Homecoming, Safe Halloween, two nights of Oldies concert, a static display by Festo at the Association of Health Care Professionals convention in Melville. We supported in-flight refueling research at Northrop Grumman with our 2005 robot by changing the arm end effector to a refueling probe and modifying the controls programming to behave like an aircraft throttle and yoke. Pilots �flew� our robot in docking maneuvers under both daylight and night flying conditions. The Booster Club organized fundraisers (two Oldies concerts, lotto, flower bulbs, sponsor pleas, etc. ), ordered Team t-shirts, and offered great team jackets for sale. Travel arrangements were made for charter bus to Hartford, CT, airline to Atlanta, GA, and hotels at both places. 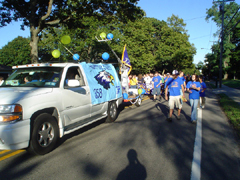 During the 2005/2006 season we had two student visits to the rookie team at Port Washington, and one visit to veteran Longwood H.S. to help with integrating the CMU camera with their robot drivetrain. Mentor visits were made to Roosevelt H.S. twice a week, the rookies at Freeport H.S. once a week, and the Port Washington rookies once a week. Additional visits were made to Hicksville, Levittown, and Plainview/Old Bethpage as needed. We also had several visits from Mt. Sinai H.S. as well as follow-up emails to get their normal driving programming ironed out. Roosevelt spend their last week of build in our lab revising and perfecting their ball shooter. We held an advanced autonomous programming workshop in conjunction with Hofstra University a week after kickoff. 11 Teams attended and for two weeks afterwards teams (Longwood, Smithtown, Levittown) worked with us to get their CMU cameras operational. We provided Team 1636 from Arvada High School, a 2nd year team from Arvada Colorado, design help basing their shooter design on ours. Their shooter worked well, it won them the Delphi "Driving Tomorrow's Technology" Award and they posted the highest qualifying round score. They seeded 8th and finished the season as quarter-finalists at the Colorado Regional. 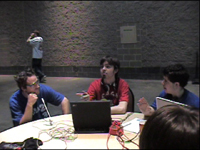 Our first competition was the UTC New England Regional in Hartford, CT where team member Matt Krass, a founder of FIRSTcast - a FIRST-based podcast, conducted interviews with Dean Kamen and other dignitaries as well as recording a FIRSTcast episode with random team interviews. In Atlanta, Matt was thrown in the fountain repeatedly by his FIRSTcast co-hosts, but we had a towel for him. At our SBPLI home Regional we helped a dozen other teams and our rookies with programming, mechanical, parts and raw stock, etc. Our Team President, Patrick Cloke, was asked to lead a thank you to mentors and was selected as our team�s Most Valuable Player. Our drive team this year was Chris Saunders, Dan Moore, Pat Cloke, plus rotating human players. and they took gold and silver again at our two competitions. 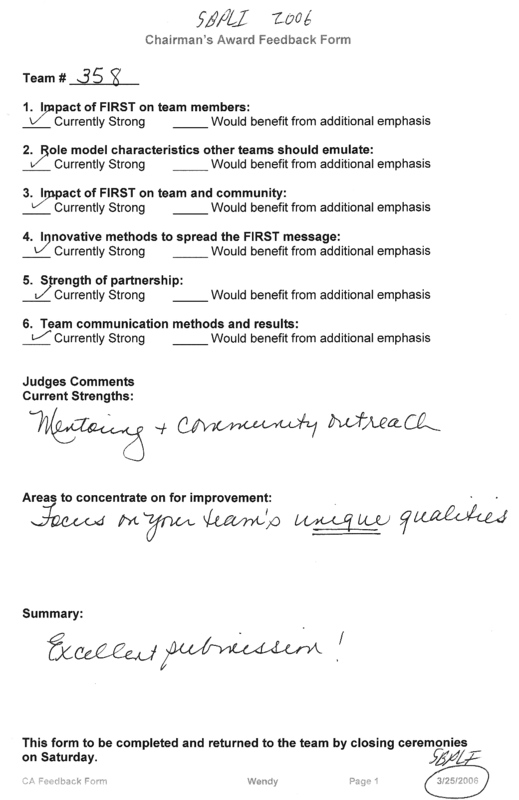 Validating our single drive team concept. Lessons (re)learned: Our robot was right on the edge of being too big this year, but we were terrific again on weight with about a pound to spare. It turns out the box frame got attached to the outside of the drive chassis rather than the inside. Frame torqing during the rough matches this year forced it further out of square and out of the sizing box. We had to forego our skins because the fraction of an inch they added was too much. At our first competition some of the welds had to be ground down to help us fit within the box. At our second Regional and at Championships the frame was twisted and difficult to fit worrying us quite a bit until it barely passed inspection. Plans for the summer include revising our business plan, adding website content, developing demonstrations for a Fall series of programming workshops, and preliminary designs to develop a 6-wheel drivetrain prototype. Whitepapers on PID, Gyroscopes, and Publicity Tips were published on ChiefDelphi. The website was completely reorganized and the history section content was greatly increased. Our giveaways at competition this year were buttons. Our button maker and supplies were purchased with a grant from the Hauppauge Educational Foundation. Students designed unique buttons for each of the competitions we attended (UTC, SBPLI, Championships) as well as generic team buttons in two sizes.